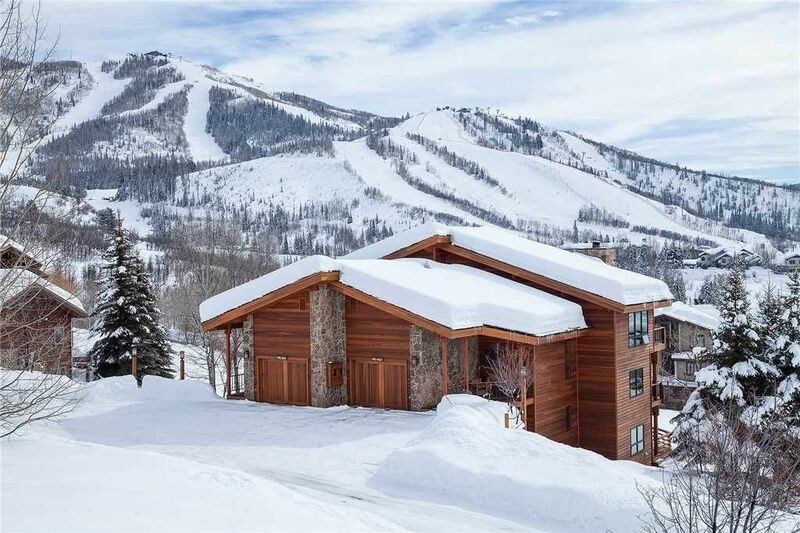 The Villa at Steamboat is a lovely mountain retreat with amazing views looking down the valley as well as towards the Steamboat Ski Area. This home offers amenities like no other, with a private sauna, large hot tub and a private Tennis Court (shared with only one other home). The property boasts three sun-drenched decks, the top floor deck leads straight off the living room, a great extension to the space allowing open-air dining and cooking on the grill. This multi-level home offers a classic cowboy charm, cool western décor and artwork are showcased through the property. The kitchen was remodeled in summer 2015, as well as new vanities in each bathroom with beautiful granite countertops. For those traveling with younger children, this vacation rental is outfitted with a high chair and a pack 'n play. Look no further for privacy, terrific views, and exceptional amenities at a private home. Please note: The Garage is not available for guest use. Great place. Super clean and accessible. Great view of the mountain. Sound system was a mess and never worked. Very disappointing. Also NO SNOW SHOVEL?! Really this is a ski mountain. Too much work removing snow with a broom and no garage parking. Very frustrating. Thank you for staying with us and sharing your feedback. We are sorry there was no shovel at the property during your stay. We agree with you that a shovel in the garage makes perfect sense, since we receive a 300+ inches of snow every winter here in Steamboat Springs! We'll also look into the sound system to see why it was not operating properly during your stay. When you visit us next, please call us for assistance anytime during your stay. We are happy to send a maintenance technician from our team to help with unexpected snow removal or to troubleshoot the electronics. We brought a group of 10 adults for our annual ski trip, some from CO and the rest from all over the country. This was the best place we have stayed yet. The house is excellent and laid out in a nice way. Well furnished. The view is incredible. Owners were responsive when the hot tub needed a little attention. No complaints whatsoever, we would definitely stay here again. Thank you for staying here with us! We are happy to hear that you enjoyed your stay. We hope to see you in the near future! Villa west exceeded our expectations. Clean, modern, well equipped, great location. Thank you for staying with us at the Villa at Steamboat. We're so glad to hear you enjoyed our vacation rental. Hope we have the opportunity to host you again in Ski Town USA. Stunning views, private peaceful location, cozy and spacious accomodations! Our family has been coming to Steamboat for 15 years, and this by far was our favorite place we have stayed! Home was so cozy and comfortable, and had everything you need to feel 'at home'! Close enough to both town and Gondolas/ski village, yet private enough to feel that you are 'on vacation' !! 11 out of 10 thumbs up!! Will stay again! Thank you for staying here in Steamboat Springs with us! We are glad to hear that you enjoyed your stay here! We hope to see you here again in the near future! Had a great couple of weeks at the Villa West. Pioneer Ridge was very responsive to our needs. Thank you for staying with us and sharing your feedback. We are glad your group enjoyed the Villa West home, and we look forward to hosting you again in Steamboat Springs. We all LOVED staying at the Villa! It had everything our group was looking for- can’t wait to rent it again during ski season so we can use the hot tub and the sauna. Thank you for your comments. We're glad you had such a great vacation. You're welcome to come stay with us again anytime. See you on the slopes!